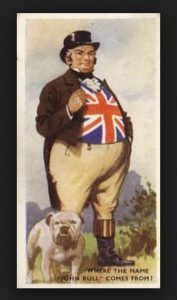 John Bull, long-lived and much-beloved English yeoman farmer, has died of self-inflicted wounds. Although born in comparatively modern times (1712), Bull’s ancestors trace their lineage to the fall of the Roman Empire (476 CE). Signal events in Bull’s family archive included the Norman Invasion (1066), signing of the Magna Carta (1215), defeat of the Spanish Armada (1588), and union with Scotland, thereby birthing the United Kingdom (1707). Bull’s finest hour came in 1940, when he and his countrymen staved off a Nazi invasion, saving both the Old World and the New from fascist dictatorship. Bull had been, until recently, a steadying influence on his country’s affairs. Over the past half-century, however (some would say, dating to the close of the Second World War and the breakup of the British Empire), Bull gradually sank into a deep depression. Haunted by vague recollections of better times (although heedless of the brutal practices of 18th and 19th century colonization which had sustained them), Bull became increasingly snappish. He resented those whom he considered invaders of his homeland, who arrived, not via Nazi amphibious attack, nor as the inevitable backwash of Empire, but via continental policies meant to address the plight of refugees and displaced persons.